A Chocolate Date cake layered with Cardamom Pistachio Ganache & frosted in Milk Chocolate Ganache, followed by Buttercream. 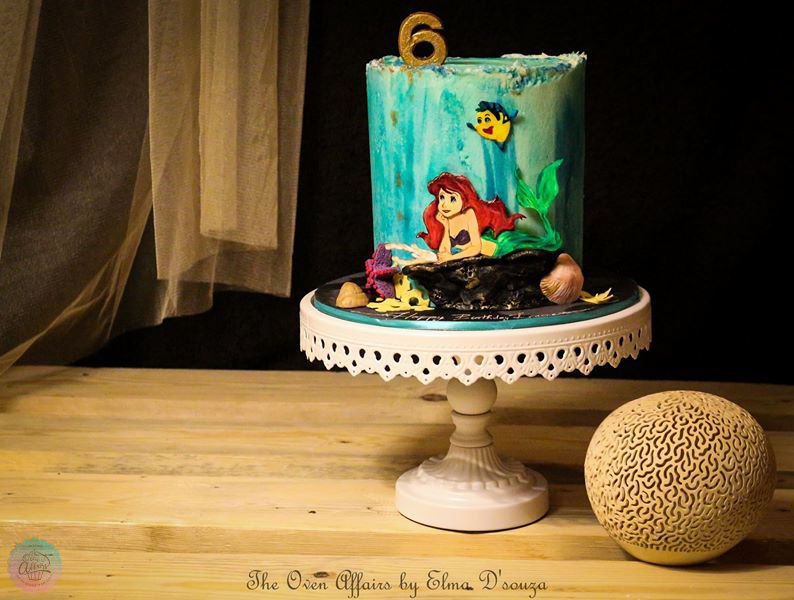 The Cake depicts a popular scene from Walt Disney's "The Little Mermaid" animation series. All the characters and elements-Ariel, Flounder and sea life have been handcrafted in fondant and hand painted in edible colors.The Buttercream has been delicately painted in Blue, Teal & Turquoise to bring the underwater feel to life.A realistic wave & tide effect has been given to the buttercream around the rim of the cake. Made for Leanne who is an ardent fan of "Ariel" on her birthday as requested by her parents Richard & Linnet.